In 1922, at thirty years of age, Count Alexander Rostov, is placed under house arrest, for being a unrepentant aristocrat. He is to spend the next thirty years at the Metropol, a grand hotel, across the street from the Kremlin. This wonderful, beautifully written novel, chronicles the count's life, over these decades, inside this enclosed interior. As history unfolds outside, life remains insulated, although the Count learns to evolve with the times, in quiet, subtle ways. I’m not sure when I last read a book as delightful and smart as this one. Count Alexander Rostov, cultured young gentleman of the old Russian aristocracy, has run afoul of the new Soviet regime, and is sentenced to live under permanent house arrest in Moscow’s Hotel Metropol. And so ends the unfettered period in a formerly vigorous and expansive life. A novel that takes place almost entirely within one structure, however grand and intricate, might feel claustrophobic. Anything but! For the Count is a reservoir of deep inner strength, of manners, of commitment to an identity, and every page crackles with the authenticity of his personhood. The writing here is impeccable. Many times I was tempted to turn to those around me to read a particularly enchanting passage. It was hard to do so, because such lines are the fulfillment of a chain of description and preparation, of which the felicitous ending is but the fitting culmination. The prose is charming, concise, unadorned, and elegant. This is a book of sublime miniatures: A sister’s silver scissors fashioned in the shape of an egret has a golden screw at the pivot representing an eye. And immense ideas as well. The vastness of inner life confronts the constraint of the external. Enduring values are set against the inevitability of change. Tolstoy’s view of history gurgles always in the background, as the reader grapples with the relationship of individual action with the impenetrable play of events. Hey, this book has already gotten over 2,500 reader reviews at Amazon and is still in the top twenty books there, so what the hell more can I say? Count Alexander Rostov, a Russian nobleman,is arrested by the Soviet secret police in the 1920s, designated a "former person," and summarily sentenced to permanent house arrest in the grand Metropol Hotel in Moscow, where he spends the next thirty years. Strangely, it is a richly full life, one which provides him with all kinds of loyal friends and even, most unexpectedly, a family of sorts. A Gentleman in Moscow is not at all what I had expected, and I'm glad. Because it is that delightful kind of literary surprise that simply enchants its readers. I'm not often "enchanted" by a book, crusty old fart that I consider myself, but this book had that kind of magic to it, all 460-plus pages. That's quite a hat trick. But I loved all of it. Bravo, Mr. Towles. And all those rave reviews? Well deserved. My highest recommendation. A Gentleman in Moscow immerses us in an elegantly drawn era with the story of Count Alexander Rostov. When, in 1922, he is deemed an unrepentant aristocrat by a Bolshevik tribunal, the count is sentenced to house arrest in the Metropol, a grand hotel across the street from the Kremlin. Rostov, an indomitable man of erudition and wit, has never worked a day in his life and must now live in an attic room while some of the most tumultuous decades in Russian history are unfolding outside the hotel's doors. Unexpectedly, his reduced circumstances provide him a doorway into a much larger world of emotional discovery. I had a hard time getting into this book at the beginning, but as it progressed I became more engaged in the story and the many sub-stories within the book. Resourceful 32 y.o. Count Alexander Ilyich Rostov is sentenced to house arrest in the elegant Moscow Metropol Hotel and his residence is moved from a second floor luxury suite to the 6th floor belfry in 1922. His crime: being born into the Tsarist aristocracy. As Stalin's grip clenches Russia, the Count, after a bout of depression, goes about setting up a life within the confines of the Metropol. Nine year old Nina, who is also temporarily confined to the hotel, provides the key(s) that release him from depression and provides him with all he needs to create a world within the Metropol. If one is confined, then one must set about establishing means to acquire life's essentials: food, beverage, clothing, meaningful work, and love. Alexander finds all of these things within the Metropol. He establishes relationships with the chef, the bar tender, the seamstress, a returning actress, and adult Nina returns to leave her daughter, Sophia, with the the Count. There are many small stories within the larger story that enhance the entertainment value of the novel. There is a clandestine assembling of a secret midnight meal in the middle of the siege on Moscow during WWII. There is ongoing relationship with Soviet General Osip in which the Count mentors him in the underpinnings of western culture. That relationship turns to the Count's advantage in the end. There are several other entertaining sub-stories embedded in the book, which I found delightful. The book is structured almost like Russian nesting dolls: time is condensed in the first and last part of the book, while the time periods between chapters expand outward in the center of the book, which is the time covering the Great Depression and WWII. Where to begin. I am a better person for having read this book. I flat out amor Amor Towles. I loved Rules of Civility and the followup e-story, but this might even be the better novel. The story itself - a White Russian count is sentenced to exile in the Metropol Hotel in Moscow (a real hotel, now in its 105th year!) when he returns from Paris during the Russian Revolution - is such a creative concept. But the execution is almost flawless, with the exception of perhaps a few too many characters. Count Alexander Rostov is everything one would want in a hero, and his family background, while privileged, does not seem to be excessively oppressive to the kulaks and peasants on the estate (although there is minimal information about this, so I judge only by his recollections). He is thoughtful, calm, and considerate of all whom he encounters in his limited hotel world. His flexibility extends to the Bolshevik regime, which is gently taunted by the count and the author. From 1992, at age 30, until 1954, the count nurtures a talented young student, balances his old friends and the new authority, maintains a quirky romance with a passionate movie star, and eventually becomes the Head Waiter at the renowned Boyarsky Restaurant at the hotel. The superlatives reviewers have lavished on this novel are well deserved. This is an enthralling, all consuming window into life in Moscow from the pre 1920's through to the 1950's, from Stalin and the Bolsheviks through to Nikita Khrushchev. We view the microcosm of what's happening in Russian history through the eyes of the man 'in the bubble' Count Alexander Rostov, who in 1922 was confined for life to the Metropol Hotel, across from the Kremlin, by a Bolshevik tribunal. Mentored by his godfather and guardian, the Grand Duke Demidov, Alexander recalls the Grand Duke's words, 'if a man does not master his circumstances then he is bound to be mastered by them.' These words mark the way Alex moves forward. How the sophisticated, urbane Count Alex handles his incarceration is wonderfully told. His acquaintances are like a panoply of stars spread out beneath Alex's new sky, the ceiling of the Metropol. His meeting with, and continued relationship with the fascinating child Nina, the harsh realities of the changes in the politburo, the advancement of small minded individuals like the inept waiter the Bishop, contrasted to the kindliness of some of the more urbane true believers. Of the many friends Alex makes amongst hotel staff four stand out; Andrey, the maître d’ of the Boyarsky Restaurant, Emile the chief, Vasily the concierge and Marina the hotel seamstress. His world, in one fell swoop narrowed, is in reality enlarged through the people he becomes acquainted with. There are his friends from the past. The angst of his writer friend Mishka, an expert on Chekov. And not to be disregarded a new friend, the actress Anna Urbanova. There's Nina the young girl who grows into a fervent young woman, typical of her generation committed to the communist ideals. Her fanatical absorption with change for the common good that at times prove disastrous reflecting the broad sweep of political, social and economic change that forgot to involve the people and it's way replaced one tyranny with another. A startling set of circumstances give him Sofia, the child he was to mind for a month, the daughter he unexpectedly acquires. She brings light and meaning to his life. Abram the handyman he encounters on the roof and from whom he learns the secrets of coffee and the miracle of the bees. A wonderful interlude that helps Alex retain his equilibrium. And the others, Osip Ivanovich Glebnikov, a former colonel of the red army, a Party man who comes to Alex to be educated in understanding the privileged classes of those countries Russia wants to enter into economic and political discussions with. England, France and America...and how they view the world. The American psyche needed to be understood. For over fifteen years they read literature, discussed and watched films together. Their run down on Casablanca is superb. A life lived within the confines of the hotel that Alex somehow ironically lived to the full, discovering new emotional truths, new revelations. Layers within layers are revealed within the story like the Russian nesting dolls Alex at one time unwraps, layers of meaning and revelation that are just as painstakingly and beautifully crafted. This novel is pure poetry, gift wrapped in vivid and taut prose. ount Alexander Rostov finds himself quickly becoming an anachronism in his own time: the Russian Revolution has resulted in a quickly changing political & societal landscape. Aristocrats and landed gentry families such as his are rapidly sinking in the rising tide of communist fervor and political change. In 1922, Rostov is found guilty by a Bolshevik tribunal (awkwardly, while he was a supporter of the pre-revolutionary efforts, noted by the committee, he continued to live as a gentleman, one of the 'leisure class' in a large suite at the Metropol Hotel). Rather than be sentenced somewhere in Siberia, the tribunal sentences him to indefinite house arrest: if he ever steps foot outside the Metropol Hotel, he will be arrested and shot. The Count is removed from his grand suite and takes up residence in some tiny garrett rooms near the belfry at the top floor of the hotel. LOVED this BOOK!!! Totally absorbing and SO much detail---I didn't want to lose Nina but then, we are rewarded with Sofia! Simply one of the finest books I have ever read. I have had the hard cover book for months and just never got around to reading it despite being at the top of my TBR pile. I wish I had read it sooner because it has become one of my all time fiction favorites. I rank it right up there with other books I loved, The Hobbit, Outlander and The Bronze Horseman. The story is of Count Alexander Rostov's house arrest in the Metropol hotel in Moscow after the fall of the Czar. The story is about how he copes with his situation, and even thrives, and the friendships he formed over time. It is 1922 in Moscow, and Count Alexander Ilyich Rostov is condemned, for the crime of aristocratic purposelessness, to spend the remainder of his days within the walls of the Hotel Metropol, which sits across the street from the Kremlin. If he leaves the hotel, he will be shot. Consigned to a small attic room without even a fine view, stripped of the majority of his possessions, his glittering social life, his much-loved library, and his freedom, Count Rostov soon becomes bored of confinement and makes a desperate mental decision. The count is not doomed to die of boredom. When too much time on his hands leads him to despair, he is rescued by new friends, hotel residents and staff, who open his eyes to the many possibilities within the hotel. He learns its every inch, its back stairs, its cellars, its kitchens. He forms alliances with small girls, a film star, an American businessman, the hotel chefs, bar staff and front desk clerks, and his days become full, his life once again important, his role an important one. The book transcends decades, and the changes in the hotel reflect the great movements of politics, trade, and wars in which the world is engaged. A stylish, yet charming, philosophical novel about what gives life meaning and how to respond to adverse circumstances with grace. Towles explores the meaning and importance of love, friendship, kindness, and what it means to be a parent. Part of the story's charm is that it isn't very realistic. Shortly after the Bolshevik Revolution, Count Alexander Rostov, a member of the Russian aristocracy, is found guilty of publishing a seditious poem. At the time, he was currently living in the largest suite of the grand Metropol Hotel. He has been sentenced to house arrest but moved to a room a little bigger than a closet. If he leaves the hotel he will be shot. For the next thirty+ years he adjusts to life in the hotel interacting with a number of hotel employees and guests, many from other countries. Alexander Rostov, a Russian aristocrat, is sentenced to life in a Moscow 5-star hotel at the start of the Bolshevik revolution. Rostov befriends a 9-year old girl Nadia who takes him back to his childhood, learning to live without privilege and the life of a commoner. Nadia grows up and returns to the hotel and leaves her 4 yr old daughter Sophie with Rostov who ends up raising Sophie to adulthood. In between Rostov befriends the hotel staff and becomes a close ally. The story is Rostov's, his transition from aristocrat to commoner and bachelor to unexpected father. In between some espionage, Russian revolution history and a daring escape. It’s 1922 and the Bolshevik Tribunal has sentenced Count Alexander Rostov to house arrest due to writing a revolt-encouraging poem. He’s considered a hero to some or otherwise he would have been shot. His current residence is the Metropol so there he’s sent to serve his sentence. If he sets foot outside of the Metropol, he will be shot. He’s taken from the beautiful suite he was living in and is put in a small attic room. The hotel is a large one but as time goes on, the walls shrink in as Count Rostov longs to join the rest of the outside world. Count Rostov has gone from being a privileged aristocrat to a “Former Person”. This is an intelligently written book that manages to grab your heart as it teaches you about the Russian world and people. The cast of colorful characters are all absolutely delightful. There is much more humor in his newest effort than in his first book. This is also a very personal insight into the horrors of Russian rule. But the horrors don’t take center stage in Mr. Towles’ latest; rather the indomitable human spirit is in the spotlight and truly shines in this compelling book. Amor Towles has surpassed his debut novel with this one and I don’t say that lightly as I loved “Rules of Civility”. 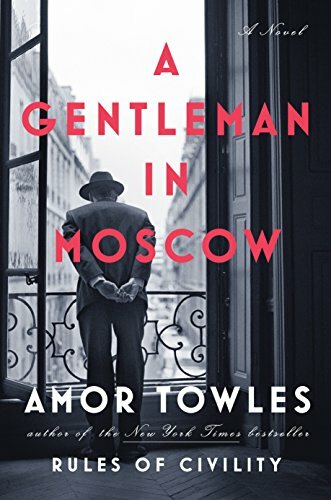 I long to see “A Gentleman in Moscow” made into a PBS series. An uplifting, wise, completely charming novel and one of my personal favorites of 2016. Highly recommended. Towels deals with the many upheavals in Russia during the period covered by his novel (1920’s-1950’s) obliquely. These events are there, but become just background noise for the Count’s efforts to be a man of purpose and not just “former person.” Rostov is indeed a renaissance man. He knows wine, food, literature and especially manners. Despite being confined to a small former maid’s room, Rostov makes do with humor and probity and in the process, transforms the servants of the Metropole into confidants and friends. Along with Emile and Andre, he forms the triumvirate of the hotel’s Boyarsky restaurant. He develops a close and romantic relationship with the stunning actress, Anna Urbanova; has a tense relationship with the bumbling Bishop, the restaurant’s loyalist headwaiter; and supports Mishka, his poet friend while he battles governmental censorship. These pale, however, by comparison to the close ties he develops with two precocious young girls, Nina Kulikova and her daughter Sofia. These intelligent and gifted girls give the Count a much needed sense of satisfaction and the courage required to resist. I just finished A Gentleman in Moscow today. My general impression of his writing and overall approach when I read Rules of Civility, shortly after it was published in 2011, was that his work is highly readable, very enjoyable, filled with bookish references for steadfast booklovers and occasional readers alike. In this book, I felt throughout that I was listening to a beautiful fairytale which happens to be set in Moscow during the heart of the Soviet period, from the early 1920s through the mid-50s. That our hero, a former gentleman of consequence, has been put under house arrest for the rest of his life—at the risk of being instantly shot should he risk himself outside—is unpleasant enough, but our dear Alexander Count Rostov—and why is that name so familiar? Because of Nicolai Rostov in War and Peace naturally, W&P being among many great classics mentioned throughout the story; the Essays of Michel de Montaigne are also folded into the story; a similar approach was taken in Rules of Civility. The fate of such a man, forced to live in a tiny room in the attics of a luxury hotel, officially stripped of his title and social influence could have been rather glum, in a similar manner to one of the guests of Grand Hotel, whose days are uniformly lonely and predictable.